The device entered our lives in a shop in Boston’s Chinatown in 1962; went on to serve with distinction in MIT’s Science Teaching Center for three years; and then followed us to Urbana IL and Columbus OH and then me to Palo Alto, where you see it now on a shelf in my living roon, alongside books on the nature of comics and just above a shelf of books of gay cartoons and comics. 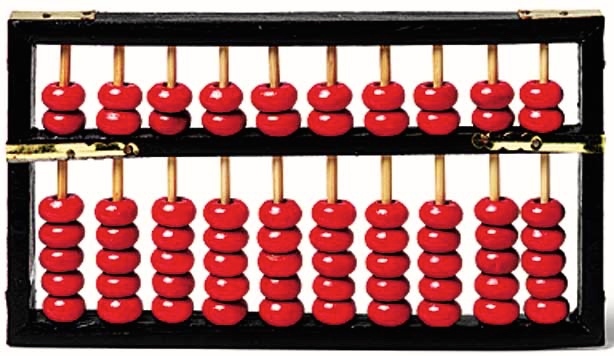 The abacus (plural abaci or abacuses), also called a counting frame, is a calculating tool that was in use in Europe, China and Russia, centuries before the adoption of the written Hindu–Arabic numeral system and is still used by merchants, traders and clerks in some parts of Eastern Europe, Russia, China and Africa. Today, abaci are often constructed as a bamboo frame with beads sliding on wires [or sticks], but originally they were beans or stones moved in grooves in sand or on tablets of wood, stone, or metal. An adding machine was [note the past tense!] a class of mechanical calculator, usually specialized for bookkeeping calculations. In the United States, the earliest adding machines were usually built to read in dollars and cents. 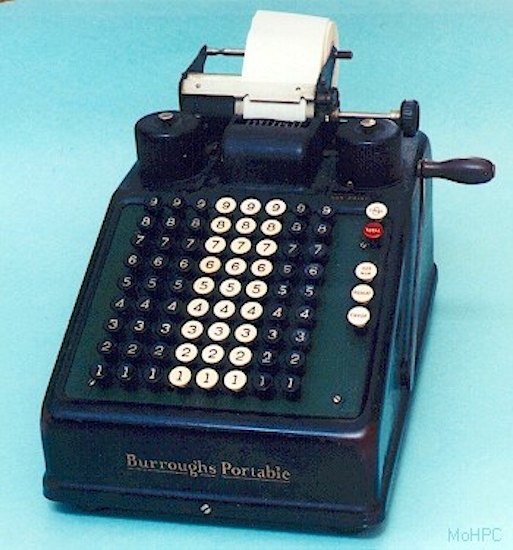 Adding machines were ubiquitous office equipment until they were phased out in favor of calculators in the 1970s and by personal computers beginning in about 1985. The older adding machines were rarely seen in American office settings by the year 2000. They were fiendishly complex machines, often quite difficult to use, and Ann looked at the one in the STC in horror and announced mulishly that she would do better with an abacus. We found a small simplified one at a Harvard Square store that was selling the things as toys, and she set to work on it at MIT. The eminent scientists were charmed and delighted. But Ann felt that the little abacus was just too flimsy and inconsequential, so we took the MTA to Boston’s Chinatown, and there chanced upon a shop selling Chinese curios and art objects, where — stroke of fortune — the shopkeeper was doing his books on the abacus in #1. That’s it! Ann cried, and we set to haggling with the shopkeeper over a suitable price for the tool he was using. It was all arranged easily, and Ann now had a proper abacus to work on. The history of the Science Teaching Center is hard to piece together. It seems to have been founded around 1960, with Jerome “Jerry” Wiesner as one of the driving forces; Wiesner, prof. of electrical engineering at MIT, was an advocate for science education, a force in national science policy, and a consummate academic politician, moving up from a deanship and provostship to the presidency of MIT in 1971-80. The directors of the STC were all professors of physics: first, Jerome “Jerry” Friedman, physics Nobelist in 1990 (still alive, in his 90s), then Jerrold R. “Jerry” Zacharias (who was at one point pursued by Sen. Joseph McCarthy, to the point where it was widely feared that he would lose his job), then Robert I. “Bob” Hulsizer. Then the STC became MIT’s Education Research Center. The Center was housed in two offices/labs across the hall from one another in MIT’s main building, with staff ranging from the eminent professors (some on long-term appointments, many visitors for shorter periods, including visitors from other institutions) down to technicians and Ann, who was nominally the secretary. The professorial staff included a number of veterans of the Manhattan Project, members of what I think of as the second generation of modern physicists (in the first generation, the founders of relativistic physics and quantum mechanics, like Einstein, Planck, Heisenberg, and Born). In particular, the charming and erudite A.P. French. (Note: searching for Tony French under the name he’s mostly published under pulls up pages and pages of information on the College Board’s Advanced Placement exam in French.) French went from the Cavendish Lab at Cambridge to the Manhattan Project and eventually, to MIT in 1962, when Ann and I arrived there. (Ann was fond of pointing out that Anthony French was English, while her friend Jacques English was French.) French is, astonishingly, still alive (at 96). Ann was, as I say, nominally a secretary (low-grade), but her typing skills were minimal. No matter: the STC wanted accuracy, not speed (lots of equations to type and the like; have I mentioned the Feynman Lectures?). And they got a multilingual employee who was also a writer and editor (distinguished physicists, even distinguished physicists who are passionately devoted to science teaching, are not necessarily great prose stylists), highly educated, enormously adaptable, and witty. (The pay wasn’t great, but the benefits were fine, and they covered the expenses of Elizabeth’s birth, at Boston Lying-In Hospital, as it was then.) It was, in many ways, a great place to work, certainly a good place to mark time before going on to grad school. And we came away with a fine abacus. This entry was posted on December 9, 2016 at 7:57 am and is filed under My life. You can follow any responses to this entry through the RSS 2.0 feed. You can leave a response, or trackback from your own site.